My mother will quite literally laugh out loud when she reads this, but I wouldn’t consider myself a messy person. Okay, so not only my mother will make fun of that statement. But, having known truly messy people over the years (and lived with them), I would say that I keep it clean…ish. Dan isn’t particularly messy either, though he is a pack rat of the highest order. I usually feel like our apartment is decent. If we were to unexpectedly die with no time to clean, I wouldn’t be too embarrassed about my mother finding it in it’s typical state. I mean, unless she checked the baseboards, which really only get dusted when she comes to visit (because she checks while I’m sleeping. Remind me another time to tell you what she did to my college apartment the week after my tonsillectomy). This weekend Dan and I finally faced the reality that was our hall closet, a closet unusually big for a metro-area apartment. When we moved in it was all organized by a system, but in the past year it has gotten… well, out of control. It could be the camping gear or perhaps the old television that Dan isn’t quite ready to get rid of yet, but it’s packed floor to ceiling with crap all the way up to the door. A problem, you could say. Since all of our day Saturday was going to be consumed with the frustrating chore of cleaning out the worlds most crowded closet, I thought ahead and made a quiche. Ever since I saw the movie Waitress (we’re big Nathan Fillion fans) I’ve spent my free time making up pies in my head, as Keri Russell’s character was apt to do. 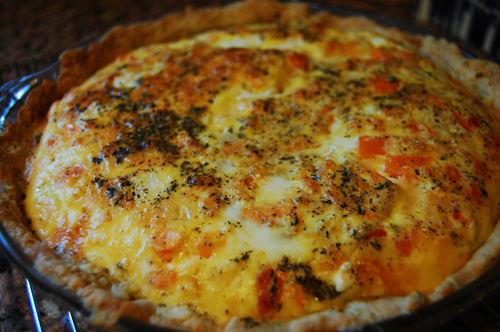 So, on my way home from work on Wednesday, while trying to figure out what to do with the heirloom tomatoes leftover from a pesto tart and the smoked mozzarella I had bought but wasn’t going to use before it went bad, I thought up the perfect quiche. And it was perfect. I made it Wednesday night while the ingredients were already out, baked it, and froze it. 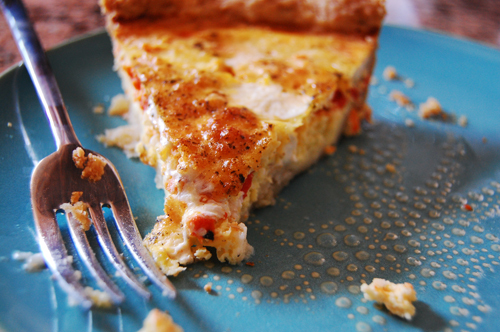 On Saturday, after hours of trying to make sense of how much crap we’ve accumulated in one short year, we sat down, watched an episode of Firefly, and enjoyed a quiche that was smoky and juicy, light and full of flavor. With a gin and tonic, of course. 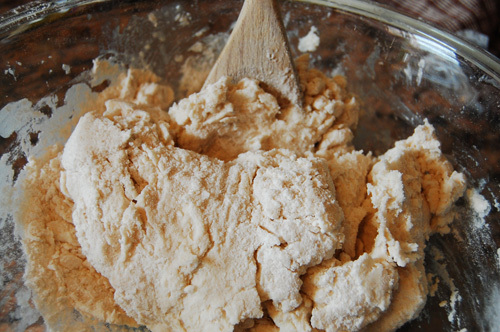 * Some adaptations to the pie dough recipe. No sugar. Add 1/4 tbsp salt. Add 1/8 cup shredded parmesan. Add 1 tbsp dried basil. Add a pinch of pepper. Put your dough into the pie dish. Toss tomatoes with half of the salt, pepper, and basil. 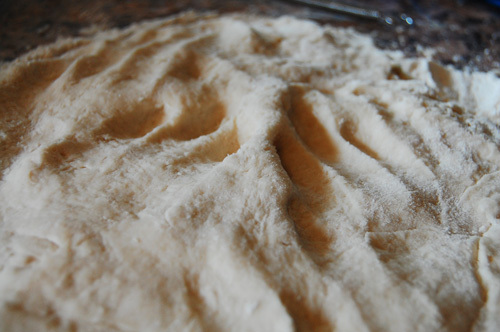 Spread into the dough. 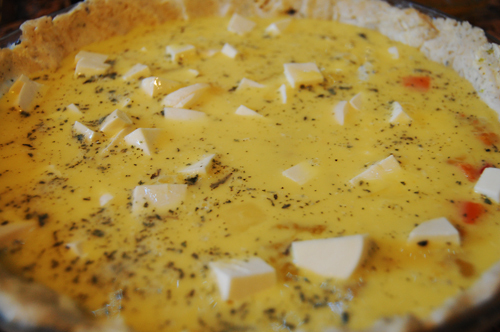 Whisk together egg, milk, parmesan, and the remaining seasoning. 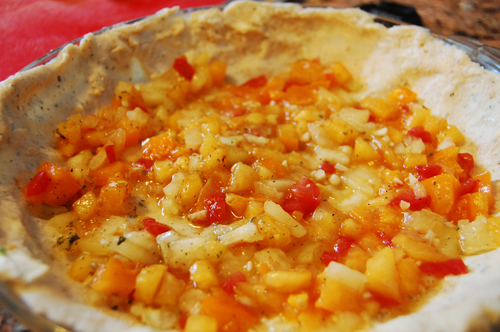 Pour over other ingredients in the crust. Bake at 350 for 50 minutes or until cooked through. The Best “AND SUCH” Y’all Have! Here it is! The much-tweeted about competition in honor of the upcoming 100th blog post on Biscuits and Such! In honor of this blog hurdle, we here at Biscuits and Such are holding a recipe competition. After much discussion (and many tacos), we decided that we were going to ask readers to send in their favorite southern recipes! After further deliberation, we decided on the perfect prize- a handmade recipe book (among other things, listed below)! The entry period will end August 26 at 11.59pm. After all entries have been submitted, we will pick 3 finalists, whose recipes I will cook. Finalists will be picked based on the overall appeal of their recipe and story (stories are a very important part of b&s, never underestimate their power). A panel of judges (i.e. Dan, myself, and some of our friends and family) will judge the recipes and choose the winner based on taste, originality, story, and, ultimately, whether or not it would be something we would cook again. There will even be score cards! I will post the winning recipe on September 6, 2009 as my 100th blog post. 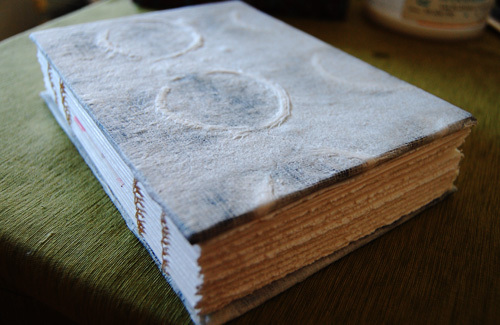 A handmade recipe book (pictured below)! Your recipe will be featured on the front page of Biscuits and Such! Your recipe will be immortalized in the b&s recipe index! 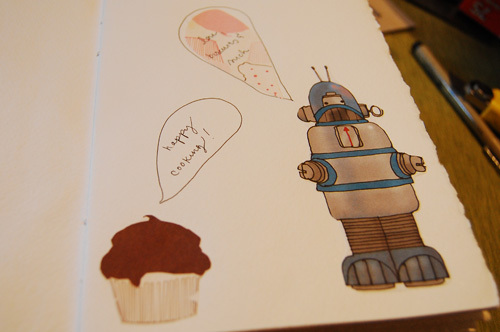 Your recipe will be featured in the Springpad newsletter (which reaches 20,000 Springpad users)! Your recipe will be featured on The Simple Me! Last November my Aunt Jill loaned me her copy of the book Julie & Julia. It was about two months after I started this site, and she thought I’d be interested in another woman’s journey to make sense of her life through cooking and writing. I loved the book, and have thought about it often while crafting posts for this site. Not that b&s is anywhere near as demanding as cooking over 500 french recipes in one year, nor was I experiencing quite the existential crisis that Julie Powell was when she started the Julie/Julia project, but I can relate. I started this blog fresh out of college, in the midst of my perfectly constructed five year plan crumbling around me. In the months that have passed since I started writing, this site has been one of the most meaningful parts of my life. It seems to make it more manageable that I’m in an off-career track job living in a city that makes me crazy in an apartment that doesn’t get enough light to keep my plants alive. I may not have a ticking biological clock (at least not too loudly, and even then only when in close proximity to cute babies), but I completely understood the feeling of being lost and let down. And, in fact, turning to a food blog to pull myself out of it. copper pots, halfway through the installation. red outline indicates copper, black indicates cast iron or steel. 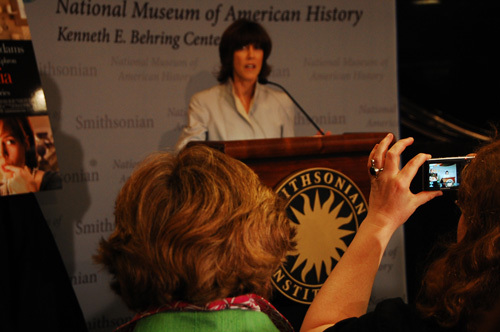 This past week I was invited to visit the National Museum of American History for two separate donation events. 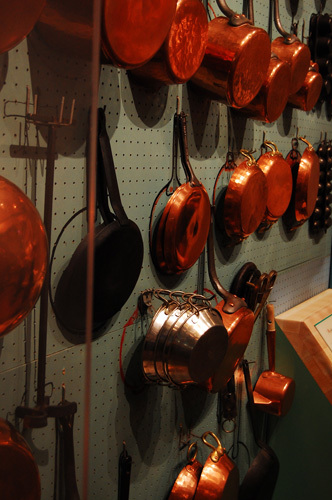 The first, Wednesday morning, was the donation and installation of Julia Child’s copper pots. The rest of her kitchen was donated in 2001 when she moved from Cambridge back to her home state of California. It has been recreated with insane accuracy inside NMAH, every last spoon is exactly the way it was the day it left Julia’s house. The exhibition containing it, Bon Appetit, is a beautiful homage to Julia Child. 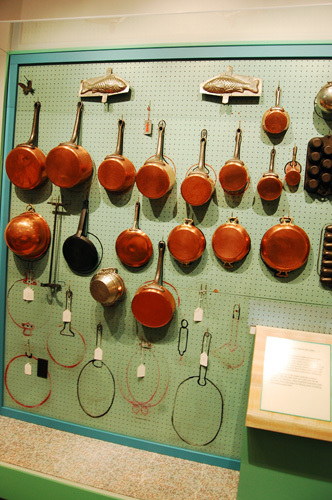 Her copper pots, however, have been on display in California since 2001, and were finally reunited with the rest of the kitchen this month. I was invited as part of a group of local foodbloggers, but I was the only foodblogger that showed up for the morning segment. In my midst were reporters from the Smithsonian Magazine, the Washington Post, and NPR. As an NPR junkie, you can imagine that I felt a little out of place. However, the event was really amazing. I watched as they hung the remaining pots on the pegboard that Child’s husband Paul painted to her specifications. He even went so far as to outline (and color code) each pot so that she knew where they belonged. After the presentation and group questions, I tagged along as the NPR reporter walked around the room with the curators, Paula Johnson and Reyna Green. Their depth of knowledge about both the kitchen and Julia Child herself is immense, and it was fascinating to listen to the stories and anecdotes. They had a story for each pot and gadget, and it was refreshing to talk to people so devoted to their craft. As someone a little young to be a part of the Julia Child phenomenon, I was aware of her while growing up, but never a devotee. However, I certainly came of age in a world much affected by Julia. She was the pioneer of what we now consider standard for food cooking shows. 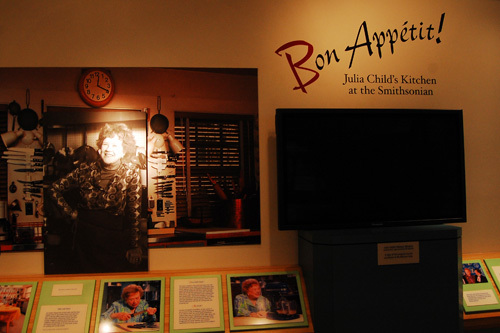 One of the things that shines through in the Julia Child exhibition is how accessible she was. Her kitchen isn’t the fancy beach front wonders that we see on TV these days. From the butcher block countertop to the 60 year old Garland stove, she cooked and talked in a way that made her viewers and fans feel like they could do it too. People saw her making mistakes and were encouraged in their own culinary escapades. The second event that I was invited to was another donation event surrounding the Julie & Julia movie media blitz. This event took place the evening of the copper pots installation and was a donation made by Nora Ephron, the director of Julie & Julia. The National Museum of American History has a division of music, sports, and entertainment that has acquired everything from Colbert’s portrait to Dorothy’s red slippers. 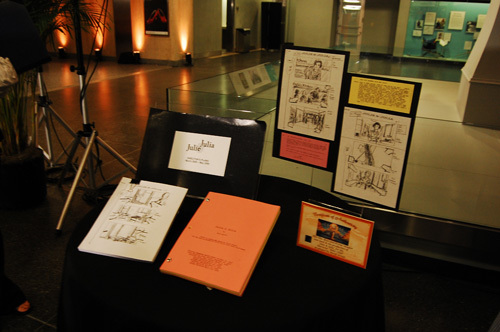 Ms. Ephron donated the movie script, director’s plans, story boards, and the dress that Meryl Streep wears in the movie as she portrays Julia Child. By nature, the evening event was not as impressive to me as the morning event. At the pot donation I was able to talk one on one with the curators, to learn and explore. The evening event was larger, more formal, and a reception. I did, however, really appreciate that Julia’s niece, Dr. Philadelphia Cousins (whose mother, Dorothy, is featured in the film), spoke. A woman with an uncanny resemblance to Julia herself, Dr. Cousins spoke of how appreciative she was that NMAH was a vehicle for the world to appreciate what Julia represented. I also appreciated it when she spoke about the movie. Oftentimes I wonder what it feels like for family and friends to see an actor depict their loved ones. It was refreshing to hear her speak about it, because I don’t believe that would be something you lied about, not even to spare the feelings of Nora Ephron (have I mentioned that When Harry Met Sally is my favorite movie?). Dr. Cousins said that when she watched Streep’s performance, her breath was taken away. Tonight Dan and I went to a special screening of Julie & Julia. I was excited to see the movie long before I knew about all of these events, so it was a special treat to get to see it early and for free. And I have to admit, I loved it. Both Meryl Streep and Amy Adams put on phenomenal performances, and it was a fantastic interpretation of the book. I don’t usually like books adapted into movies (I’ve had to suspend reality when watching Harry Potter movies and become all what book?, J.K. who? ), but I thought this was done nicely. I think, actually, that my favorite part was watching Dan enjoy the movie. I read an interview with Julie Powell a few days ago where she says how much she loved the portrayal of her husband, Eric. I would like to think that I am not as prone to meltdowns as she is, but I know that I have put Dan through more than his fair share. It was gratifying to watch him take in the movie, grunt in sarcastic laughter when the scenes in the movie mirrored scenes from our own kitchen. It may be that there is an overarching tone to the whole movie about partner appreciation, but I really did appreciate Dan a little more walking out of the theater. dress by ann roth from julie & julia, the movie. made for meryl streep in her depiction of julia child. When I was invited to take part in all of these events, it was with the hope that I would help promote Julie & Julia. I am not, as I try and make clear on this site, in the business of hawking things that I don’t believe in myself. However, I feel comfortable telling you how much I enjoyed every part of this. When I first read the book, I loved it. I felt like I understood Julie Powell’s perspective and have been following her blog since because I’m interested in her as a writer. I also strongly recommend that you visit the National Museum of American History and take in Julia’s complete kitchen. Even as someone who didn’t grow up on Julia Child, I have, over the course of the past year, started to appreciate her hold over the American public, a combination of absurd behavior and whimsy. And finally, I do recommend that you go see Julie & Julia, the movie. I promise I’m not getting paid to promote the movie, it just made me feel warm and fuzzy inside. 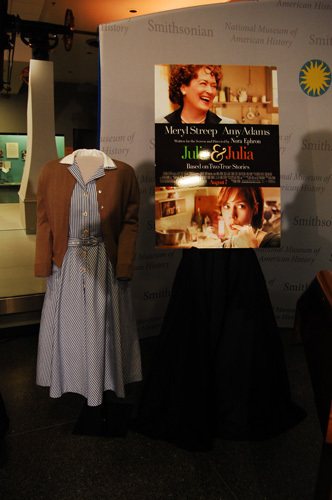 In the final scene in the movie and one of the final scenes in the book, Julie and her husband Eric drive to NMAH to visit Julia’s kitchen and to leave a box of butter in front of her portrait. This scene struck a cord with me. Partly because they drove down Georgia Avenue (a street I drive down daily) and partly because I’m always touched by a pilgrimage (especially one containing butter). It does make me wonder- in a world full of food stars and celebrity chefs, who do you feel a connection to? Would you travel to New York to place a poblano pepper at Bobby Flay’s doorstep? Would you bring Paula Deen a cup of mayonnaise? Finally, now, I’ll get around to the recipe. I knew when I decided to post about this experience that I needed to pick a good recipe to post with it. But Julia Child was a classically trained French chef, so what recipe would be fitting to post on a southern food blog? I spoke to Paula Johnson, one of the curators of Bon Appetit!, and she recommended a recipe from Julia’s Kitchen Wisdom. This recipe is the last in the book, and is even labeled as a post script. Julia notes that every good recipe book should include biscuits, and then goes on to explain that these are her adaptations of southern biscuits. 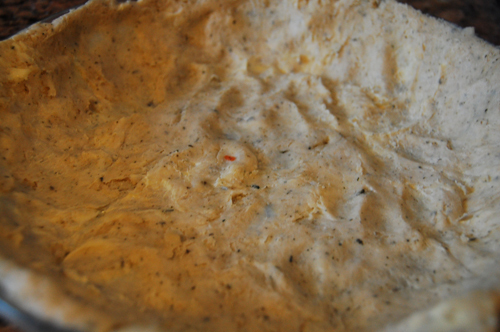 Even though this recipe is pretty similar to my rosemary biscuits, I thought it was perfect because it combined all aspects of my experience and my newfound knowledge of Julia Child- her American roots, her love of technique, her desire to cook everything and anything, and, of course, my southern roots and the purpose of this blog. 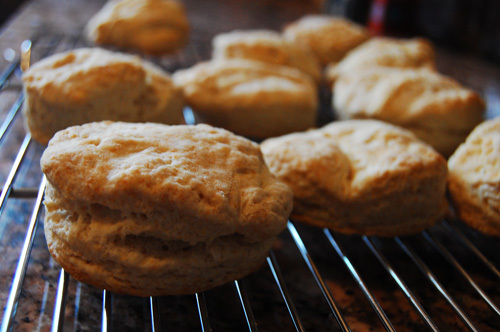 So I offer to you today Julia Child’s baking powder biscuits. Use a pastry knife (or two knives) to cut in vegetable shortening. Blend until the texture is similar to cornmeal. With a wooden spoon, stir in milk. 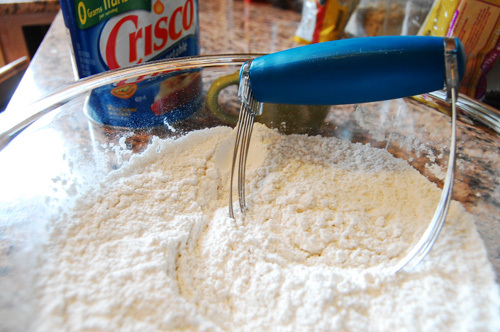 Dump out onto a floured surface and fold in half 6 times over. Spread with your hands until it is 3/4″ deep. 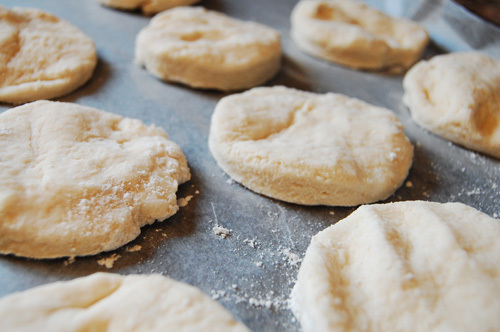 Use a biscuit cutter to cut 10-12 biscuits. Place on a piece of parchment paper and bake at 425 for 10-12 minutes.